Start one of the best adventure trips of your life with arrival at New Delhi and board Volvo for the overnight journey to Manali. On arrival at Manali check-into the already booked hotel and relax till afternoon. Grab your lunch and gather at the hotel lobby to get the briefing about the journey. Later on, test your motorbike skills and enjoy a test ride on the challenging roads to acquaint yourself to handle the bike for your entire trip. Return back to the hotel for comfortable dinner and overnight stay. On this day of your Leh- Ladakh Motorcycle Tour start your ride by Royal Enfield to Rohtang Pass which is situated at the altitude of 3978 meters above the sea level. It is the first leg of your journey and is your first challenge as the roads are not smooth and weather conditions are uncertain. Pass through the Lahaul Valley and enjoy watching its several villages and confluence of Chandra and Bhaga Rivers etc. Proceed through Jispa which is your stop of the day. Enjoy the dinner and overnight stay at the pre-booked hotel. After breakfast drive towards Sarchu leaving behind Jispa to enter the Greater Himalayan Landscape. Enjoy the splendid views as you pass through the Baralacha Pass which is 5,000 meters above the sea level. Keep driving towards Sarchu which is the border line between Kashmir and Himachal. From here proceed towards Sarchu camp. Relax and capture the beautiful surroundings in your camera. Enjoy dinner and overnight stay at camp. In the morning post breakfast start your journey from Sarchu to Tsomoriri which is around 230 Km from Sarchu and takes around 07 hours. Enjoy tea break at Pang and then continue your journey towards Tsomoriri. En-route enjoy the panoramic views of Tso Khar Lake. The evening is free to explore some local places. Walk around Karzok village situated on the banks of lake and visit the Karzok Monastery. Upon arrival, check into the pre-booked hotel for dinner and overnight stay. Post breakfast the day starts with lots of challenges. Start your journey through the flatlands that takes you into the mountain horizons. Drive through the Tanlang La-pass which is the second highest motorable mountain pass in the world situated at the height of 5,300 meters above the sea level. After crossing the pass continue your journey through Leh. En-route enjoy a visit to the ancient Thiksey and Shey Monasteries which are among the major attractions of your trip. Upon arrival, check into the pre-booked hotel and enjoy rest of the time at leisure activities with sinner and overnight stay at the hotel. After breakfast start your journey towards Khardungla Pass which is situated at the elevation of 18360 ft from the sea level. In the afternoon, explore the major attractions of Leh which includes Leh Palace, Shanti Stupa, Lamayuru Monastery etc. Enjoy shopping at the local markets of Leh and taste variety of cuisines. Spend the evening at any of the garden restaurant which is quite popular over here. Enjoy overnight stay at the pre-booked hotel. On the 8th day of Leh Ladakh bike tour packages after early breakfast drive towards Pangong Lake which is the largest brackish water lake in Asia and is among the major attractions of this trip. 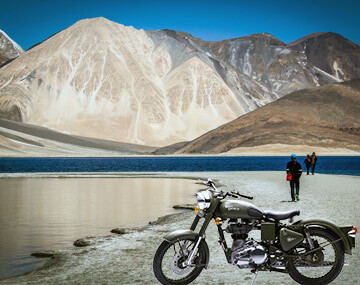 Arrive at Pangong Lake and enjoy the beauty of this magnificent lake which is shared by two countries India and China. After a halt at the lake proceed towards Chang La and then the Army check point Tangse. After enjoying the whole day in scenic surroundings return back to Leh hotel for dinner and overnight stay. After early morning breakfast bid adieu to Leh and begin your bike ride. En-route you will see the scenic spots of Ladakh’s majestically beautiful landscape and continue your journey towards Sarchu which lies in the middle of two beautiful destinations Leh and Manali. Upon arrival, check into the pre-booked camp for dinner and overnight stay. Post breakfast begin your drive through Sarchu plain and reach the Baralaccha Plain till noon. After lunch start your journey again by crossing the Lahaul ranges and then the Rohtang Pass and then the Manali. Upon arrival check into the pre-booked hotel and enjoy the farewell dinner with your team members and share the beautiful memories of this trip. On the last day of your adventurous bike tour get transferred to Volvo to board the coach towards Delhi. The most exciting and adventurous Motorbike Expeditions comes to an end with the arrival at Delhi. A Manali- Leh Motorbike Expedition is one of the most thrilling and challenging expeditions. It is counted among the best adventure motorbike safaris in the world. This fun-filled and exhilarating expedition involves crossing over the high mountain peaks and challenging passes and travelling through the most spectacular and picturesque landscapes in the world. So pack your bags and load your cameras to capture the memories of the most memorable experiences of your life. BookOtrip is renowned for offering unforgettable travel experiences to its customer no matter in which part of the world you want to travel. Manali to Leh bike trip packages is one amongst them which offer visitors a truly majestic experience to enjoy and cherish throughout their life. Hotel’s Check in/out time is 12 noon. The Important essentials to be carry during the Expedition: Helmet ,Glasses, Gloves, Leather boots, Pants and motorcycle jacket. To ride, we recommend a small backpack that may contain: Solar cream, Lipstick, Wipes, Scarf or turban Sunglasses, Cap, Rain gear to keep morale in thunderstorms, Spare gloves to start perky after the rain, Water essential for drink driver, Swiss knife, Flashlight or headlamp. Essentials for the Evening:Tee-shirts, Woolen/Cotton Socks, Long-sleeved shirt, Sweater or sweat shirt, Spare pants and shorts Swimsuit, Lightweight shoes, Blanket. Towel, Toiletries, Personal medication (2-3 bandages, eye drops, antiseptic, Imodium, NIFL Uril.and aspirin, excellent to combat headaches associated with altitude). 25% of total tour cost charged as cancellation charges for booking once made. 50% charges apply before 30 days of arrival date and no refunds thereafter. If any part of package is not availed, refunds cannot be claimed for and neither is any part of package exchangeable with some other services. Due to weather conditions and reasons beyond our control, changes to the itinerary might occur, for which the company accepts no responsibility. There is no personal insurance of any kind included in the tour price. Travel insurance should be obtained from your place of residence, before commencement of trip we will not be held liable for any illness, injury or death sustained during a tour. All tour payments must be made in advance (at least 60 days prior to arrival). Oh My God the trip to ladakh was the most adventerous trip of my life. The bike ride in the hill mountain was Awsome. Thankyou BookOtrip ! !